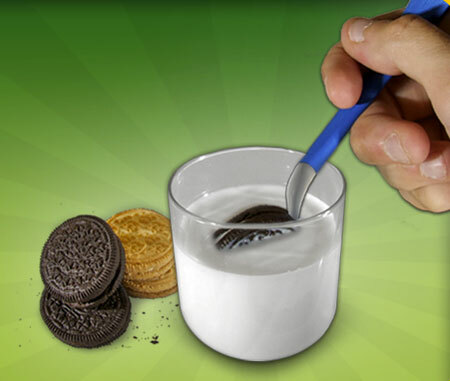 The dipr is a spoon that holds your sandwich cookie while you dip it in milk, coffee or any other liquid that you like. 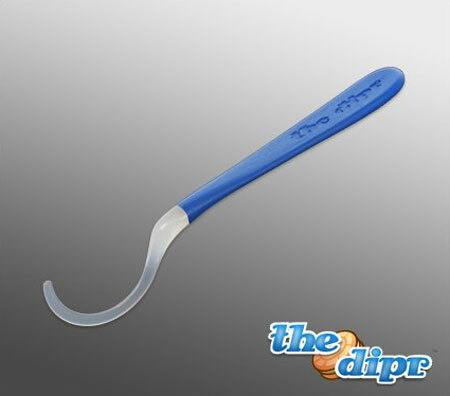 The dipr also allows you to have a germ-free dunking experience since your fingers don’t have to touch the liquid anymore. I think the little dipr is pretty cute, honestly. However, since it only works with sandwich cookies like Oreos and Hydrox, it seems to be more clutter for the kitchen than a tool to simplify your life. I’m also not sure how it’s really any different than a regular spoon, which you already own. The earthquake and hurricane this past week on the east coast have left me glad I made August’s resolution to update my “In case of …” file. Mother Nature sure knows how to drive home a point in a really big way. In addition to creating the file, I’ve also started to take a new approach to how I see the items in my home. Not only is the stuff we own there to serve my family’s needs and bring us joy, but it is also stuff that someone else might have to deal with in case of an accident. Obviously, I hope no one else ever has to deal with our things, but it’s important to consider that it is a possibility. Do I have something else like this that fulfills the same purpose? If this is a duplicate item, which of these items is in the best condition, of the best quality, and will last me the longest? Is this item in disrepair and need to be replaced or fixed? Does this item make my life easier/save me time/save me money/fulfill an essential need? Why does this object live in our house and is this the best place for this object? Do I need to do more research to know if this is the best object to fulfill its essential need? If this is a perishable item, has its expiration date passed? Will this item be easy for someone else to deal with in case I am not capable of doing so? Does this item help me to develop the remarkable life that I want to live? My first link of the day is to a book review professional organizer Julie Bestry wrote about “Everything I Know About Perfectionism I Learned from My Breasts.” This book, written by the talented organizer Debbie Jordan Kravitz, has been on my to-read list for months but I haven’t yet reached it in the pile. Julie’s review of Debbie’s book, however, has convinced me to jump it ahead on my list. And, since it persuaded me to read the book, I thought it was a review you might wish to read as well. Not only does knowing how to properly use your kitchen utensils save you time, space, and money, but knowing additional uses for your utensils can have the same effect. There are so many wonderful things about Gayle’s office. The most amazing thing about it is that the entire office can fold up and completely disappear. Second, everything is contained, nothing is out cluttering up the workspace. Third, everything is well labeled. My guess is Gayle has no difficulty finding anything in her office. Fourth, the magnetic strip on the left side of the cabinet is a nice alternative to a traditional cork board and takes advantage of what might otherwise be unused space. Fifth, the cable management is fantastic. And, finally, the pull-down work surface makes this a nice size workspace considering that it is an entire office in an armoire. Thank you, Gayle, for submitting your impressive office to our Flickr group. We have a number of musical instruments in our house. Due to humidity concerns, we like to keep them stored in their cases year-round. What then, to do with the big, clunky cases? Rather than hiding them under a bed, which would be inconvenient since we actually play the instruments regularly, we keep them rested on a Guitar-Stor rack where they are easily within reach. It keeps the cases from scratching the walls and it looks nice in our living room where we practice. The racks come in several styles and finishes. We opted for the basic MDF model in black, for a more contemporary look. In this configuration, the Guitar-Stor is priced at $475. The company also offers more elaborate models in both cherry and walnut finishes with hardwood construction. The manufacturer’s website only shows guitars on the Guitar-Stor rack, but you can see from the photo taken in our house that we have no trouble storing cases for both mandolins and violins on the rack. 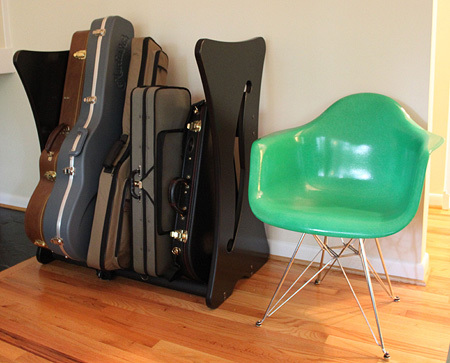 These Guitar-Stor racks are not an inexpensive solution, but they are very well-built. We think it’s a small price to pay if you have expensive guitars that you want to keep safely out of the way when not in use. Toothpicks are great little tools. You can soak them in water and then use them to hold bacon on filet mignon during grilling. You can use toothpicks to get poppy seeds out from between your teeth. 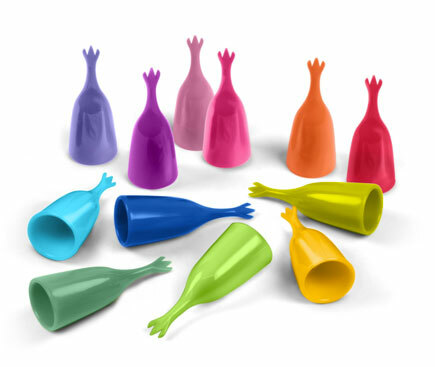 You can stick them in cheese cubes, little sausages, olives, and other finger foods on appetizer trays during parties. You can poke one into a cake to determine if the cake is done baking. You can use a few toothpicks to create a small shim for an uneven table leg or to level a picture on the wall. Heck, you can do even more things with them, but you already know that. They’re also made from wood — a renewable and recyclable resource. 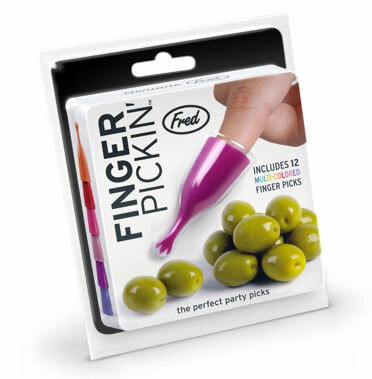 Except for spearing food to eat, the only other use I can conceive for the FingerPickin Cocktail Picks is accidentally poking out one’s eye with one. Obviously, this would have happened late in the evening, after much alcohol had been consumed, and only after a series of miniature sword fights failed to provide long-lasting entertainment. Thanks to reader Em for introducing us to this cute little unitasker. Continuing on the theme of letting go of fear from yesterday’s post, I wanted to provide some strategies for how to let go of your uncluttering fears. Most of us have them — I certainly do — but they shouldn’t keep us from achieving our uncluttering and organizing goals. The fear that you’re making a mistake. Mistakes are a part of life, and you’re going to make them. As long as the mistake isn’t fatal, you can recover from it. Thankfully, very few mistakes related to uncluttering are life-threatening. It’s okay if you get rid of what you think is clutter and then later realize you need it. Borrow the item from a friend the one time you need it or rent it or buy it used off Craigslist. With one-of-a-kind items that you don’t know if you’ll be able to easily replace, consider long-term loaning these objects to close friends or family members who are interested in using the objects. Then, borrow the item if you find you ever need it. The fear that you’ll fall on hard times. You may actually fall on hard times at some point in the future. Unfortunately, a smooth path through life isn’t guaranteed for anyone. Owning clutter, though, isn’t going to help you through those difficult times. Clutter can keep you from being able to quickly respond to a problem or handle it well. Clutter can sometimes make the problem worse. The fewer things you have to clean and maintain during a tragedy will allow you to focus on what really matters during those times. The fear that people in your life won’t understand. This is going to happen. Someone in your life will be confused by your desire to live without clutter. Don’t worry, though, you’re confused by other people all the time. It doesn’t keep you from loving them or being friends or enjoying their company — and the same will be true for other people who are confused by you. Life would be boring if we were all the same. The fear that someone else in your house will just clutter it all up again. Once again, this is a real possibility. It’s also a real possibility that you’ll be the one to clutter up the space again. The risk that the space might become cluttered again isn’t a reason not to unclutter. There is also a big possibility that the space won’t get cluttered again. Uncluttering and organizing take practice, just like all skills. Michael Phelps didn’t win an Olympic gold medal the first time he jumped into a swimming pool. The fear that your life will change, and change is hard even when it’s good. Your life will change. You won’t ever know how amazing an uncluttered life focused on what matters most to you is until you give it a try. It’s your choice, however, and you should only make the change if you really want to. No one can unclutter your life except for you, other people can help, but you’re the one who has to do the majority of the work. We’ve written in the past about the Banana Saver and the Banana Slicer, but did you know you could also get your hands on so many more banana unitaskers? Reader Jon wrote to us asking if we had any tips for preparing lunches at home that he can take to eat at work. He has been spending $100 a week on eating out at restaurants, and is hoping to become someone who brings his lunches to work. Since students are already back in the classroom in many states, and other students are getting ready to go, I thought now would be a great time to discuss the humble brown bag lunch. I want to introduce you to the MSR Flex 4 System Cookset. So you have a lemon, and you only want to use half of it? Wow. Now that is a conundrum. Do you have multiple games that are stored on small discs or do you carry small cards for work or your camera? How do you keep them stored in a safe and organized fashion? I have a 9-yr-old girl with long hair. She has zillions of barrettes, headbands, clips, bobby pins, etc. and I need some good ideas how to organize these! Any suggestions?? The managing editor of cookthink.com shares with us ideas for saving space with magnets in your kitchen. Danielle LaPorte interviews Erin on the Style Statement website. I can’t seem to find a way to keep my jewelry organized while traveling. A simple solution, of course, would be to only bring one or two pieces when I travel, but for longer trips I don’t really like this option. Any suggestions? Thanks! I’m more of a minimalist jewelry wearer when I travel, but my mom and sister-in-law are not. Over the years, I’ve noticed that both of them travel with a small velvet case especially made for traveling with jewelry. Their special cases have different areas for rings, earrings, necklaces, bracelets, and watches. The one my mom carries even has strips of fabric that weave through the necklaces so they don’t become tangled. There are numerous options available through Amazon (1, 2, and 3) and I suggest you find one that best meets your needs and go with it. These cases keep your jewelry organized during transit, and they are also extremely easy to toss into a safe in a hotel room. Another option is to pack only highly versatile pieces that are suited well for travel. Pack earrings, a necklace, and a bracelet that can be worn with casual or dressy garments and that are a combination of a yellow gold and a silver metal (white gold, silver, steel, platinum, etc.). These two color options extend the possibilities for when you can wear them. In my case, I wear a wood watch that when turned around looks like a snazzy wood bracelet, which is perfect for day and evening. Thank you, Katie, for submitting your question for our Ask Unclutterer column. Please check the comments for even more ideas from our readers. I’m sure there are other folks (jewelers?) who are constantly traveling with jewelry who will have even more ideas for you. 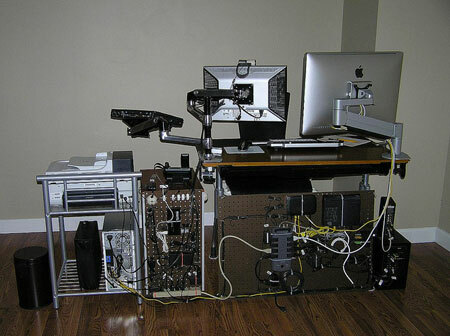 Instead of an entire office, this week I chose to feature the wire wizardry of a single workstation. All of the cables as they leave the equipment are tethered to other nearby cables with what looks like plastic zip ties. These ties are extremely versatile, inexpensive, and simple to cut off if you need access to the cable. Once in a cable bundle, they are then routed onto the back side of a piece of pegboard and to the power strip, or up toward another piece of equipment on the desk top. The power strip and other wall warts appear to be tied to the pegboard with plastic zip ties, too. Finally, I also like all of the adjustable monitor arms and the peripheral stand. Thank you, JoyMystic, for submitting your desk to our Flickr pool.